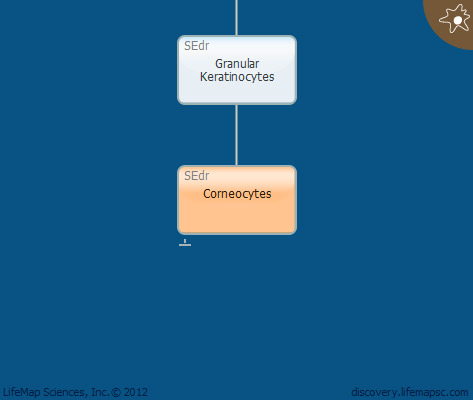 Corneocytes are non-living cells that form the outermost layer of the epidermis by process of cornification. This cornified layer is responsible for the water impermeability of the skin. Corneocytes are tightly linked to each other by corneodesmosome. Cornification differs from apoptosis and is associated with reduced cell volume and degradation of the nucleus and cellular organelles. Transglutaminase activity is the most important aspect of cornification. Ca++ release from the degraded endoplasmic reticulum and mitochondria is required for proteolytic activation of transglutaminases, which participate in cleavage of intracellular components. The degraded cellular components are replaced with protein cytoskeleton. Filaggrin, produced by upper layer granular keratinocytes and its precursor profilaggrin, generated by corneocytes, are proteolytically cleaved into smaller mature molecules. Filaggrin is an essential component of the cornified envelope as it aggregates the keratin filaments into tight bundles. In addition, filaggrin molecules are further cleaved into free amino acids and participate in the regulation of skin osmolarity and moisture. Secretion of lipids from the lamellar bodies to the extracellular space and their cross-linking to the protein cytoskeleton results in formation of the cornified envelope, which substitutes the plasma membrane. The newly formed cornified layer is multicellular and functional but biologically dead. The outermost corneocytes shed off the skin layer upon degradation of corneodesmosomes.